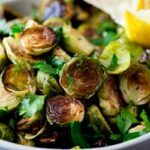 These Roast Brussel Sprouts are an amazing and delicious side dish that are the perfect side for so many different dishes. 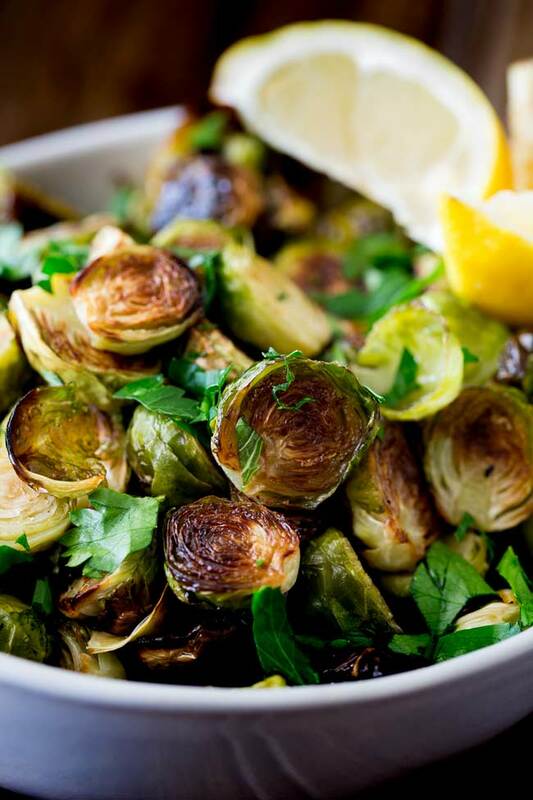 The brussel sprouts are simply dressed in olive oil with plenty of salt and pepper, before being roasted to a crisp perfection, then finished with lemon zest and fresh parsley. 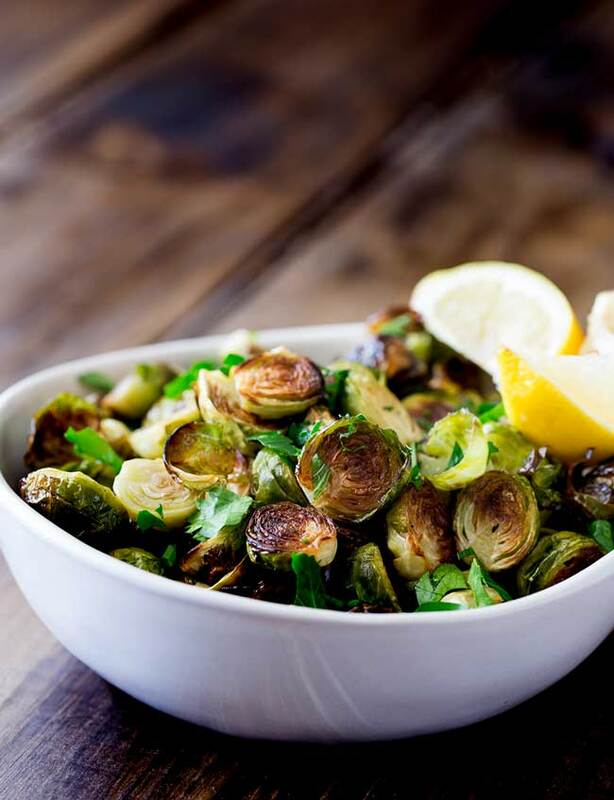 FUN FACT: There is a Guinness World Record for most Brussels sprouts eaten in one minute! In 2008 a Swedish man named Linus Urbanec ate 31 brussel sprouts! 31 brussel sprouts in one minute!!! Bet he didn’t roast them! How to Roast Brussel Sprouts? Have a hot oven (450ºF/230ºC). Cut the brussels sprouts in half so all the layers crisp up. Dress with olive oil and plenty of salt and pepper. Spread them in a even layer on a sheet pan. Roast the brussels sprouts for 15-18 minutes. What can you put on Roast Brussel Sprouts? Don’t these roast brussel sprouts look delicious! I know what you are thinking…..but brussels sprouts aren’t popular, so few people enjoy them. I know I know, but roasted this underrated vegetable become sweet and smokey and miles away from the soggy boiled brussels of our youth! We were all told as kids that we had to eat them because they were so healthy. Are Brussel Sprouts really good for you? Yes, Brussel sprouts are super good for you! They are high in Vitamin K, Vitamin C and Vitamin A, as well as beta carotene, folic acid, iron, magnesium and fiber. Cut the brussel sprouts in half and spread them out over a sheet pan. Toss the sprouts with the olive oil, salt and pepper. 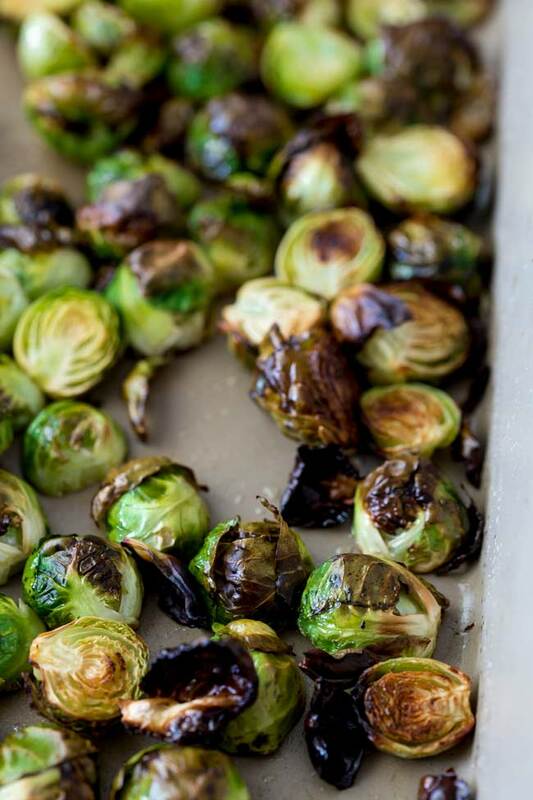 Spread the brussel sprouts in an even layer on a large sheet pan and then roast for 15 to 18 minutes. Whilst the sprouts are roasting zest the lemon and then and squeeze the juice from just half the lemon. Remove from the oven and sprinkle with the zest of the lemon. Sprinkle with the parsley and lemon juice just before serving. I LOVE brussel sprouts! When we were kids we used to have competitions to see who could eat the most! My kids are not so keen!!! But roasted either with lemon and parsley or with garlic oil they will eat a small portion. I am not going to lie…they are still not their favourite, but they will eat them this way. Got to love a good BBC whodunit and a classic cocktail. Since dinner is sorted as I have my BBQ Shredded Pork cooking in the slow cooker, I might go make another. 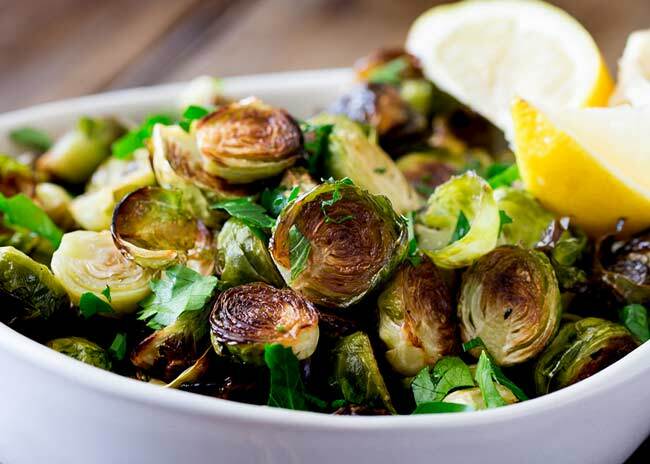 If you love food why not subscribe to my newsletter, I will drop you an email every now and then, just to say hi and send you a couple of recipes think you might love, like these Roast Brussel Sprouts with Lemon and Parsley. Thank you so much dear! We loved this recipe and we are not even sprout lovers. How fabulous are these brussels?! These were a veggie I never really liked growing up by now I love them. Especially like this with lemon. I hear so many people say that Chrissy, I wonder what it is that stops them appealing to kids?